Brackley Town boss Kevin Wilkin admits he will have to pick his players up for Sunday’s Buildbase FA Trophy final. 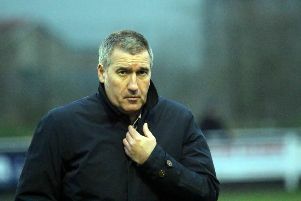 Wilkin saw his side’s Nanarana National League promotion hopes ended in Sunday’s 3-0 play-off final at Harrogate Town and fears they may suffer a hangover at Wembley. He said: “My biggest worry is that the players appeared to be drained on Sunday so we’ve got to regroup this week and focus on Wembley. My main concern now is that some of the poor decisions we made were through mental tiredness and if that is the case then we’re not in the place we want to be. “We’ve played 61 games, that’s not an excuse because we want to be in these situations, but some players looked tired at Harrogate. It may have been Wembley on the minds of some players but we can’t make excuses because we booked our place there a few weeks ago. “We’ve got to make sure we don’t fall into that trap again on Sunday, the players have got to deal with the situation better. We’ve got to understand why we’ve done so well this season and get back to that for Sunday. Wilkin will work with his players at tonight’s (Thursday) training session and again on Saturday morning after the squad have arrived at their overnight base for the final.